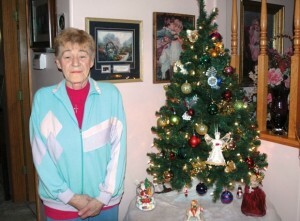 Like many grandmothers, Eva Schamp will again spend Christmas with her family in 2011. Gary Schamp, her husband of 56 years, says that’s a bit of a miracle. Eva thinks it’s a miracle others in her situation can experience, too. Eva wasn’t supposed to be here. Through her own fighting spirit, the dedicated work of her doctors and caregivers, and the unyielding support of her family, she has defied the odds. Eva, now 72, was diagnosed with leukemia not long before Christmas in 2001. She was told it was terminal and she had not more than six weeks to live, probably less. Eva had spent much of the summer fighting fatigue, breaking into sweats and lacking energy. Her tests had shown the presence of leukemia and she was admitted to the Good Samaritan hospital in Corvallis right away. “I’d never even heard of an oncologist until then,” Eva said. 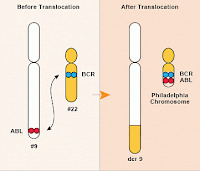 It was determined she has Philadelphia chromosome, an abnormality that causes a rare form of leukemia with a dismal prognosis. That was on Dec. 17, 2001. Last Saturday, Eva and her family celebrated 10 years of life since her diagnosis. Family has been an important part of Schamp’s recovery. Gary and the Schamps’ daughter, Mary Mintken, traded shifts watching Eva and taking her to daily visits at Good Sam. With the bedside vigils of her family and through her own determination, she was still alive. “First she was a week past the time they gave her. Then a month. Then six months,” Mintken said. In June 2002, after fighting infections, lengthy hospital stays and administration of different drugs through IVs, Eva began taking Gleevec, a drug developed in part at Oregon Health & Science University in Portland that had just been approved by the FDA. Gleevec is among a new class of medications that works by blocking a specific protein that enables cancer cells to multiply. Schamp went into remission. Over the last 10 years she has regained her active lifestyle. Schamp gardens, does all her own housework, travels with family and paints. She also meets regularly with a group of other cancer patients. Eva admits the drug, which she still takes daily, was a big part of her recovery but doesn’t discount the efforts of her family and doctors — Stephen Neville and Peter Kenyon. I Use to be a Mountain Girl; Maybe I Still Am! One of the greatest things about this time of year is the chilly nights. They remind me of when I use to live in Big Bear Lake; Ca. Big Bear is a fabulous, small mountain town in southern Ca. The days are warm and sunny, and the nights are crisp and clear. Not many that live in southern Ca. can say that they have really seen the stars, unless they have left the abundantly lit sky, of the millions of lights, which the inhabitants turn on, every night as soon as the sun goes down. The sky, without the city lights is breathtaking. Upon returning home, after going down to the valley, my youngest son always used said, “Look, Mom, the stars are home now, and so are we.” I always loved that! I really think that I am a mountain girl at hear. In addition to the starlit sky and the smell of pine, another one of our favorite things to do was to have a fire. We had one every night during winter and often during the other seasons, as well. I was an expert at lighting the fire and keeping it going. I often had two fireplaces, one with a blower for heat and one just to look at, going at the same time. I knew how to bank the fire so that I could start it again in the morning and I never tired of listening to the roar of the fire. So, now that it is cooler at night, we often find ourselves lighting a fire, even if we have to open a window, or two, to keep from melting. Joe is typically in charge, but tonight is our dance class night and I am home alone; sick. Since it is quite chilly tonight, I decided that even though Joe wouldn’t be home, it might improve my mood to keep the fire burning, I mean after all, I used to be an expert fire tender, so I can do it, right? So, Joe started the fire before he left, and a while later, I noticed that the flames were starting to die down, as I was preparing to add another log onto the fire, a branch fell out of the fireplace and onto the hearth. Now only half of the log was on fire, and since I had a potholder in my hand, I reached down, picked up the log and threw it, AND the potholder right into the flames in the fireplace! Now I know that it has been awhile since I tended a fire, but come on, really? Did I really, just do that? Ugh, my poor brain! My first reaction was to reach in and grab the potholder, but it literally incinerated right before my eyes! I have never seen anything catch fire and disappear, so quickly. Hopefully the rest of the night will be more relaxing and uneventful. Leukemia Bonus: No Wait at Disneyland! Oddly enough, dealing with leukemia has been less painful than dealing with the side effects that I suffered after taking only 4 doses of an antibiotic, Cipro. The pain in my muscles, joints and tendons was excruciating for the first three months and lingered, in an extremely painful state for an additional eleven months. I often wonder if I had found the products offered by LGMedSupply, if my pain might have become manageable. 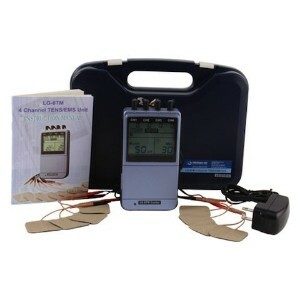 They offer products that can be used in your home, such as the TENS Unit, Muscle Stimulators and the LG-TEC Dual Combo TENS Unit and Muscle Stimulator combo unit. Their products are designed to aid in pain relief and to stimulate your muscles, thus creating better muscle tome along with muscle pain rehabilitation. Cipro destroyed the collagen in the balls of my feet, creating a bone to floor contact. My joints were swollen and my tendons felt as though they would burst if they were used. They recovery was long and painful, and I am still not 100%, I still wonder if I would benefit from LGMeSupply’s Pain Relief Products which are used by thousands of patients worldwide. All of their items and in-stock and you can view additional information at their online customer blog. If you are suffering from muscle pain, please Visit LGMEDSuppy Online. I'm not really one to plan out things beforehand. I've never really been that way. But it's OK with me. I prefer it that way. It seems like when I do try to plan things ahead of time, it just doesn't work out as well in the end. I threw a Halloween party on Sunday afternoon, so of course Friday night I was online with my clear internet looking up some recipes and other things that I could do for the Halloween party. It seems like it's so much more difficult to throw a Halloween party for kids than it is for adults. With adults, you can just give them cocktails to entertain them. With kids, you have to give them all kinds of activities and crafts to do. I was able to throw together some crafts at the last minute and the kids had a lot of fun! Luckily, I also had an old Halloween costume of my own that I found in the attic and washed that was perfect for the party. A Ghostbusters costume never truly goes out of style. My Daughter and four of five grand-kids! What I have come to understand, is that the best way to measure the burden of disease (leukemia) in your body is to monitor Bcr-Abl RNA or DNA in the blood and bone marrow. 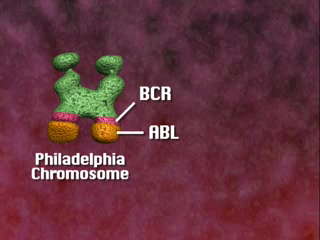 The goal is for the Bcr-Abl to eventually become undetectable. It seems to be that a person that starts their treatment on Sprycel (Dasatinib) tends to reach these milestones, a bit quicker than if they were to begin their treatment with Gleevec (Imatinib). My first PCR results, were five months ago, in May 2011, and the reading was 5.9 x 10-2. My last results are in and I have reached 3.99 x 10-4. This is a significant improvement and I have reached it in record time. Next test will be in December. I am hoping for a terrific Christmas surprise of my numbers coming in in the negative category! Thanks for the continued support and prayers! Recently I had a conversation with fellow CML’er (chronic myelogenous leukemia) regarding the medications that are readily available to treat chronic myelogenous leukemia. Currently there are three of them; Gleevec (Imatinib), which was the very first medication, Tasigna (Nilotinib) which is the second generation and Sprycel (Dasatinib) the third generation drug. Of course all of these medications come with a very high price tag; I am talking thousands of dollars, each and every month, for the rest of our lives. I am not sure of the cost of Gleevec and Tasigna, as I am currently taking Sprycel, but I do know that the uninsured price tag of Sprycel is $15,986 a month. I believe that Gleevec is in the $5,000 range and Tasigna around $8,000 per month. Of course this all depends upon your dosage and your insurance, but whatever the case, it is pretty darn pricey to stay alive! I am not entirely certain how the treatment for an individual is reached, whether some doctors just always start their patients on Gleevec and gradually make their way through the other drugs as needed, or if it’s based upon the patient’s insurance and which drug they cover. I know that my doctor discussed the side effects, the availability, and way in which each drug must be ingested, with me, in addition to the amount of time that it takes for each drug to “work” or just how quickly a certain drug appears to reach certain phases in this disease. I know that every person responds and reacts differently to each and every drug, and I also know that statistically speaking, it seems as though with each new generation of these TKI’s (tyrosine kinase inhibitor) there is improvement in one way or another. 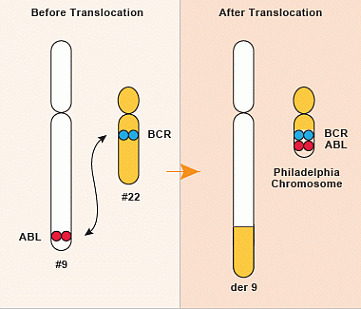 Sprycel seems to have the fewest side effects across the board, and seems to result in a quicker molecular response. I am sure that they are currently working on a “newer, bigger and badder” drug that will someday be available to those of us that will need it. For me, I considered my options and chose to go with the newest drug, believing that just like cell phone and computers, as soon as you purchase one, the next best thing will be available the very next day. I just figured that by being the third generation, that some of the bugs, mostly being side effects, which affect my quality of life, had been improved upon. I am not a doctor, but I did do my research and feel as though I made the best decision “for me.” I encourage you all to do the same. Since my insurance does not cover any prescriptions whatsoever, I was very fortunate that my doctor was very well educated in this department and told me not to worry. He claimed that he had never had a patient unable to get their medication. He gave me a slip of paper and arranged for my first week of Sprycel to be covered 100%, while he did the paperwork to have me covered by Destination Access, which would continue to cover my medication; 100%. Of course there are guidelines, which luckily I fit into. The major guidelines are that your insurance does not cover your prescription and that you make less than $75,000 per year. For full requirements visit the Sprycel Destination Access Program and you can view the Sprycel Prior Authorization Process. I am continually surprised by the doctor's and patients that do not know this great program exists. My Sprycel has been covered by Bristol-Myers Squibb, through Destination Access for the past eight months. I cannot express my gratitude enough to them for giving me the gift of life. Thank you from the bottom of my heart; which is able to continue to pump my Sprycel treated blood! I had the greatest surprise ever this week; my daughter in law, single-handedly drove my four grandchildren, seven hours, in her min-van, to my house to celebrate the oldest one’s sixth birthday. If you do the math, you will realize that she drove four children under the age of six, just to come and see me. She is one brave woman and I cannot thank her enough. It was a great week full of baking cakes, making Halloween decorations and sewing headbands. The kids were awesome and the week was a huge success. My daughter even managed to bring my grandson up for an overnight; it was the very first time that I ever had all of my grandchildren under the same roof, at the same time. And guess what? I didn’t even manage to get one picture of all of us, all together, in the same frame. Guess we will have to shoot for another visit! 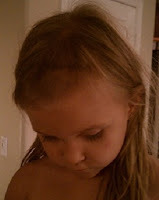 While they were here, Aubrie, four years old, brought along the consequences of an impromptu haircut, from her neighboring four year old friend. A few weeks before their visit, Aubrie’s little friend whacked off the front of her hair, right down to the scalp. 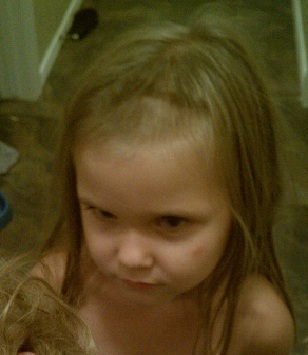 Her mom then took her for a “real” haircut. Since the girls are aware of my leukemia, and know that children can also get leukemia and lose their hair, Aubrie reluctantly allowed over ten inches of her hair to be cut, in order for it to be donated to “Locks of Love.” We actually sent it off in an envelope while they were here.Her haircut is adorable and her mother has made the cutest ever headbands to help hide the front part of her hair. 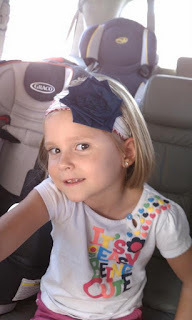 The headbands are so stinking cute; I have found that they also help to cover up my ever thinning hair, as well. I guess I can thank Aubrie for a new look! I will be posting the etsy link as soon as she gets up and running. Thanks to the generosity of a friend and fellow dancer, my grandkids were able to spend a fabulous day at Disneyland while they were here, too. What a bright light in my life that week was; thank you, Sabrina! I think that I have finally recovered from all of my excitement and shall be posting updates on blood work and other such things as the week progresses. Thanks for all of your continued prayers and support. Life has been crazy for me during the past two weeks. The craziness began with a trip to the Paradise Dance Festival. I competed for the last time this year. I came in second overall and wish that I had danced better, but that is nothing new. As much as I hate to admit it, I am afraid that this damn leukemia is just going to get its’ wish; to slow me down. I have been fighting tooth and nail to live my life just like I was before I was diagnosed with leukemia. Dancing was one of the things in my life that I was trying the hardest to hold on to. I won’t stop dancing, but I know that I need to stop competing; at least for now. I just cannot count on feeling good, often enough to practice on a consistent basis, and I never know how I am going to feel when the competition day actually arrives. Not to mention, the competition itself; it has become increasingly exhausting. I do really great for the first four dances, but my energy wanes greatly over the next four. Not to mention, I am completely wiped out by the time the weekend is over. So, for now, I will continue to practice and dance when I am able and will have a tentative plan to compete next May, in Fresno. 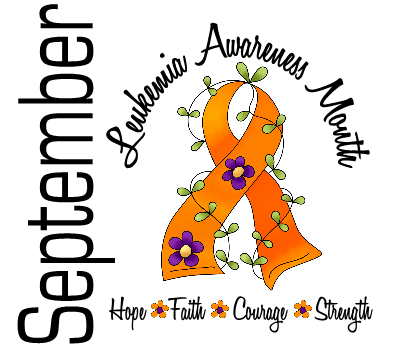 Leukemia, Life and the Delete Button! Why is it that it seems as though the delete button only works when you do not want it to? You know those times when you create the perfect resume, school report or email and it just suddenly disappears; yet, when you maybe say something that you don’t mean, or your words do not come out just the way you planned, they are sent or said out into the universe, never to be forgotten or returned. I am sure that we have all said or done things that we would like to delete, but as Murphy would have it, the delete only seems to come into play when we least want it to. I wish that I could delete my leukemia, yet I would not wish to delete the friendships and knowledge that I have gained from having it. I am sure that there are many things that I have done that I wish I could delete, but would I want to delete the lesson learned? No, I would not. I guess that the best case scenario would be to learn the lesson the first time and not have to repeat it; therefore there would not be a reason to hit “delete.” So, I guess that the delete button is really nothing more than a reminder that good things do often end and to embrace the good, forget the bad and when all else fails just hit; Delete! I am relatively certain that another thing, which cancer patients have in common, is the feeling of despair. For me, it is a feeling that comes and goes. Many days I forget that I even have leukemia; I feel pretty darn good and am able to keep up with the tasks, of the day, at hand. Other days, even the simplest things can seem daunting; such as making the bed or doing a load of laundry. On these days, I just force myself to carry on. I make myself put the clothes into the washer and hit start; I drag myself to the dryer and force myself to hang up the clothes; often that is where they stay; waiting until tomorrow or the next day when the sun is shining brighter in my world, and I can and will carry them to the closet. I don’t know what brings on the feeling of despair; it could be my medication or the fact that I have just been pushing myself too hard. It could be the fear of my cancer becoming stronger and me becoming weaker. It could be the financial and emotional burden upon me and those that love me. Or maybe, I just woke up on the wrong side of the bed. Whatever the cause, I am glad that I realize that this feeling is just a part of having cancer; and that this feeling is temporary. Throughout my life I have lived through situations that have caused despair and always come out on the other side. I am generally a person full of sunshine, hope and optimism with energy to spare. I think that part of the problem is accepting the fact that my “normal” has been changed; and I do not like that change. I do not like my new “normal.” Does that mean that I am no longer full of hope and optimism; no, it just means that some days it is a little more difficult to see the sunshine. Bracelets are in the Mail! 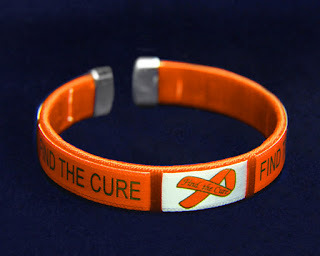 Thanks to all of you that purchased my leukemia and cancer bracelets. They are in the mail, and they are beautiful! Hopefully you will all like them. 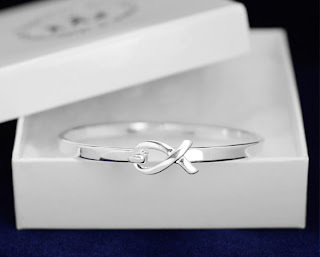 I have had several people that are actually sending the links to friends that are having birthdays and letting them chose which style they like. Thank you for doing this! 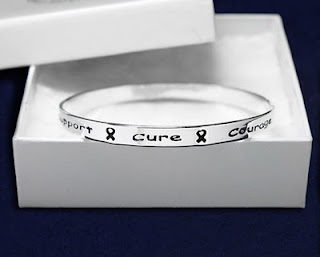 I will continue to sell the bracelets as long as there is an interest and desire. I suppose that since it is National Leukemia and Lymphoma Month, now would be a great time for me to begin freaking out about my medical insurance that resets on January 1st of every year. Since I have been self-employed, in one form or another for most of my adult life, I have never had the good fortune of being included in the benefits of an employer’s health insurance plan. I have had to purchase my own health insurance, which I have done through Anthem Blue Cross, for the past thirty years. Fortunately, I have had the wither-all and means in which to do so, despite the high rates and low benefits that have been available to me. I have always figured that some health insurance is better than no health insurance at all, and since I have always been in great health, a catastrophic insurance plan has always been a good choice for me. A catastrophic health insurance plan is literally just that. It does not pay for the small medical instances such as a sore throat, flu of urinary tract infection, but does cover larger instances such as appendectomy’s, or in my case, cancer. The biggest drawback is the extremely high, yearly out of pocket expense. Last year, needless to say, I met that expense in one fell swoop; when I was admitted to the hospital, after being diagnosed with leukemia. Normally, this would not be an issue; I would have been hospitalized, cured and sent home. I would have had to pay one, great big, out of pocket insurance deductible. I would have recovered, picked myself up, dusted myself off and gotten right back to work! The issue arises from the fact that my type of leukemia is not curable, only manageable, which means, extremely high medical costs that reset on a yearly basis. I will need to come up with a $5000 deductible at the first of every year for the rest of my life. This in addition to the many other out of pocket expenses and extremely high cost of my medication, has kept me up many a night; worrying. I have been very blessed with random and surprising donations, and am extremely grateful to all of you that have helped me in my fight thus far. I have never been very good at asking for help of any kind, but I am afraid that I have been humbled by leukemia. I have found a few writing gigs and some sewing and cakes that need making, but I am afraid that none of these are yet profitable enough, to keep my head (and body for that matter), above ground for long. 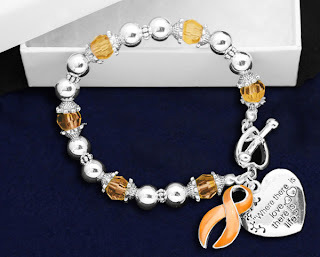 I have found some really cute bracelets that are cancer/leukemia related and I am going to try and sell them as somewhat of a fund raiser. They range in price from $15.00 to $18.00. If you simply wish to donate, there is a place to do so in my right column. Desperate measures require desperate times. Of course, I am also willing to consider any and all other options or opportunities offered to me. For those of you that can and do, my humblest thanks. For those of you in the same boat, or even one with more holes in the bottom of it, you have my emotional support and empathy. And to all of you that just read and support me through encouragement and kind words, please know that I am eternally grateful. To order, just click on link below the picture. Thanks! A cancer diagnosis is difficult for anyone to cope with. Harsh cancer treatments, like surgery and chemotherapy, take a toll on the mind and body. Cancer affects both the physical and emotional wellness of cancer patients. Support networks help them untangle their jumble of fears, frustrations, and feelings. 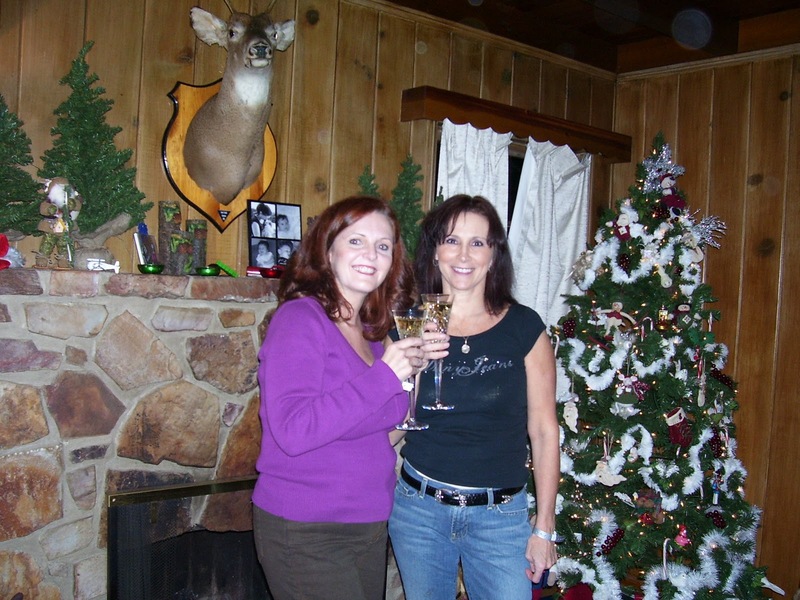 Many deep friendships develop through cancer survivor networks. Family members provide an important support system, but unless they have experienced cancer themselves, their understanding is limited. They also have their own emotions to deal with. People who attend cancer support meetings understand each other, because everyone is going through the same thing. Talking to someone in a similar situation is reassuring for people with cancer. Groups make it easy to get and give support and advice, and to gain a fresh perspective. The members share personal stories and celebrate life together. Cancer support networks come in the form of community groups and online networks. They are typically free to attend, and they usually welcome anyone affected by cancer. Community groups often meet in hospitals, churches, civic centers, or member homes. Online networks allow members to connect through discussion boards, chat rooms, blogs, and electronic messaging. Friendship and emotional support are major functions of cancer support networks. Through support groups, cancer patients and survivors are reminded that they are not alone. While each cancer experience is unique, every patient must deal with treatment and care options, side effects, and numerous decisions. Through cancer support groups, members help each other cope. In addition to camaraderie, cancer support networks provide practical assistance. Some groups provide hats, wigs, scarves, and turbans for clients undergoing chemotherapy. Many offer free transportation to meetings and doctor appointments. And all support groups provide valuable information and resources to help people cope with treatments and recovery. There is a cancer support group for everyone. Some support groups are designed for people touched by certain types of cancer. For example, “Reach for Recovery” supports women with breast cancer, and “Man to Man” offers prostate cancer support for men. The Cancer Survivors Network, an online community sponsored by the American Cancer Society, is open to all cancer patients, survivors, families, and friends. Whether someone is struggling with a treatable cancer like non-melanoma skin cancer, or they are dealing with a rare disease like mesothelioma lung cancer, cancer support networks are invaluable in every phase of the disease. Emotional support is just as important and medical care for people affected by cancer. The positive, optimistic outlook of cancer support networks can make the cancer experience a lot easier to cope with. All is well in my world, but unfortunately I cannot say the same for my precious granddaughter; it seems as though her little friend decided to try out her hair cutting skills on my granddaughter’s hair. 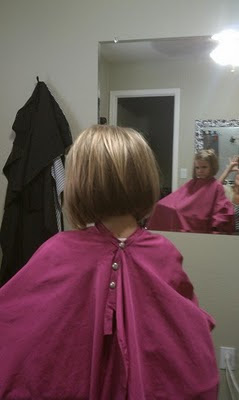 My granddaughter is the little girl that never wanted to cut her hair; she did not want a haircut, no matter what. 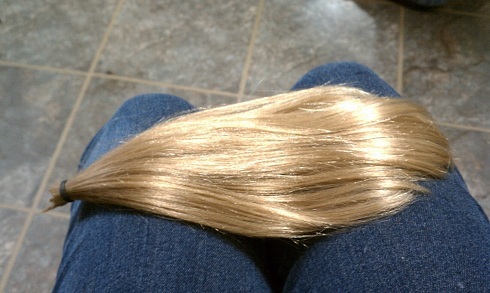 Her hair was long, well below her waist. It was beautiful! It is amazing to me that even at four years old peer pressure can get to you. Her friend started out by cutting her own hair; she said that cheerleaders didn’t have bangs, so she didn’t want bangs either; so one snip, and no bangs. Aubrie was next. The problem with this is that Aubrie didn’t even have bangs; her hair was all one length. Long beautiful hair; cut to the scalp, all of the way across the front of her head; bangs and half of the front of her hair gone. I am guessing that it took more than a snip or two. My heart just breaks for her; she is the girlie, girl; the one that always wants her hair done, the beads on and wears some sort of catawampus outfit every day. She likes to be all dressed up and loves the Glitz. She now looks quite silly with all of this long hair in the back and literally nothing in the front. He mother showed her a picture of a little girl with leukemia, just like Nana has; only this little girl had no hair. She asked her if she would like to help that little girl look pretty and give her some of her own hair; her answer was simple and straight forward, “No.” Did I forget to mention that she is also very decisive? Despite the “No,” her mother took her for a haircut. Luckily she did have enough hair to donate to locks of love and her hair does look really adorable; eventually I think that even she will begin to like her new haircut, if for no other reason than it will no longer hurt when it is brushed. Important lessons in life rarely come easy; her parents had just had the conversation with her about being her own person. They told her that even if her friends tell her to do something, it doesn’t mean that she has to do it; especially if it makes her uncomfortable, or she knows that it is wrong. Talk about timing; looks like she learned this lesson the hard way. Nothing like a big bow! For those of you that have been following my story, you will remember that my leukemia (CML) diagnosis resulted during a routine checkup, following ovarian tumors that I had seven years ago. I continue to have regular checkups every six months and as of today, I am a bit overdue! I briefly saw my doctor, the one that diagnosed me, when I was in the hospital in February. I have not seen him since. I am hoping that today’s visit will be uneventful and that no new issues will appear. Oddly enough, I have never been concerned when going to these appointments; I truly believe, that even though I had borderline ovarian tumors, and there is a chance that they will return (in a different location, of course) that they were removed and that is that. They are gone and will never return. I have never been concerned or worried. I thought that I “did” my big ticket item and that I was done. Ha! Jokes on me!! The irony of being diagnosed with leukemia during one of these visits is still boggling my mind. Fast Forward: I saw my doctor yesterday and fortunately it was uneventful. Everything in “that” department looks A-OK. He told me that he is still astounded that I have leukemia and that in all of his years practicing medicine; he has never diagnosed a patient with a second cancer. He is a gynecological oncologist, so he sees and treats cancer patients every day. I almost think that he feels worse about my diagnosis than I do! He was just so shocked and empathetic; and the girls in his office, the same one that I have been seeing for years, just kept saying how blindsided and sorry they are; and how they just can’t stop talking about it. I’m not sure if that is a good thing or not. I believe that to them, I represent the reality that no one is invincible. 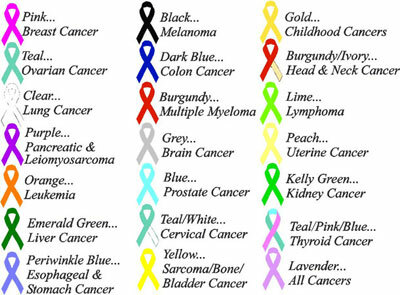 We are all vulnerable and even the healthiest people can and do, get cancer. I am living proof of that. When my ovarian tumors were discovered, also routinely, everyone thought that they would just turn out to be benign cysts. I was young(er), strong, healthy, ate well, exercised and did all of the “right” things. We were all quite surprised at just how sick I was. Fast forward seven years and I show up, for all intense and purposes, I looked, and was, healthy; a bit pale, but otherwise healthy. One blood test later and BAM; I am in the hospital with leukemia. So, I believe that to the girls in the office, as well as others, I represent the unexpected reality that your life can dramatically change at any given moment. No one is bulletproof. Anyway, life goes on and I am happy to report that other than this stupid cancer; all is well in my world. Better than Christmas: Visiting My Kids and Grandkids! It has been a long time coming; I finally am able to travel and visit my son, daughter in law, and four of my grandchildren. I was able to have the two older girls with me for a few days this summer, but I haven’t seen Brookie, since Christmas last year, and I only briefly got to see the brand new baby, born in May; once. I am so anxious to get to know that little boy. I am really hoping that he doesn't take one look at me and burst into tears! Shockingly, enough everyone is actually healthy, with the exception of my son who randomly tested positive for mononucleosis, a few months ago; so, guess won’t be kissing him. Other than that all of the kids are well. I brought my meds, extra vitamins and precautionary breathing prescription, just in case, but I am hoping for an uneventful, healthy trip. It is so hard to not have them right down the street, like they used to be when we all lived in Boise. They are now in the Phoenix area and I am in Los Angeles; it is just too far away. What happened to the days when families all lived in close proximity to one another? If I had my wish all of my children and grandchildren would live in their own homes, walking distance to Nana!